The result of this multiplication is the LCD. 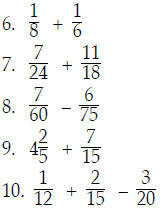 Multiplied out, we get 360.
add fractions using this method. This time, we will find and use the LCD. with the LCD in the bottom, compare the factorization of to the . Next compare (the denominator of ) to the . Notice that the answer we get, , can still be reduced: . Ex: . Find the LCD of all three fractions (we won't do the addition). of and is 30; the LCM of the numbers 6 and 15 is also 30.
fractions by converting to the LCD. "The Eleven Steps to a Good Grade In Math"
1) Take good, complete class notes, employing the lecture outline as a guide. textbook for similarities to your problem; then try your problem again. there may not be time, or we may not be able to get to your problem. and terminology into your "memory bank." if there is a quiz (announced or unannounced). 11) One final suggestion: don't get discouraged, and above all don't give up too easily.